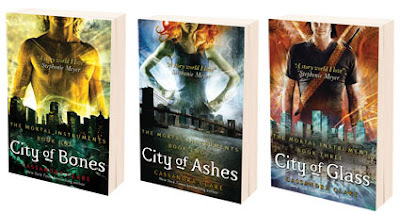 More than 5 yrs ago my sister Becca kept recommending that I read City of Bones by Cassandra Clare. She gives the best book recommendations! I picked it up and I only made it a chapter before I set it down. I did that 3 more times. I couldn't get into it. I will literally never forget the day when I kept reading past that first chapter. Sebastian was an infant. He was just sleeping, eating, and pooping. I went to bed and decided to give City of Bones another try so Becca would stop hounding me. I read past the first chapter and kept reading. By midnight I'd finished the book and then grabbed the next book on my kindle. By morning I'd finished City of Ashes. I took a nap and then read City of Glass. Three books in 24 hrs. A personal best. The story had my imagination going crazy! It was all so unique. 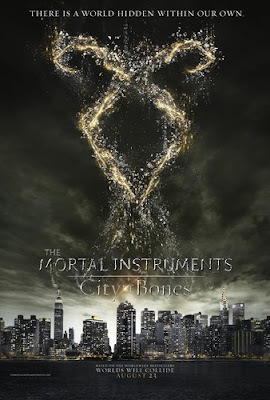 Last night I went with some friends to the cinema to see The Mortal Instruments: City of Bones. This has been a highly anticipated movie for most of us. I'm pleased to say I loved it. They did a good job interpreting the book. While different in many ways they stayed true to the story. The demons were scary, the institute looked exactly like I imagined, and cast did a great job. It was really good. Jace isn't who I pictured but I do think Jamie Campbell did a great job. He is just too skinny for my taste. Looks like a goblin. They gave away the ending but whatever....I suppose it translates better on screen this way. But, you miss the element of surprise like you have when reading the book! I enjoyed it though. I'm not a book snob in any way, but I do think it would be easier to understand if you read the book first. The shadowhunter world is one that has a lot of detail. I wouldn't want anyone to miss out. Read the book. Then email me and tell me how shocked you are! Then watch the film. You won't be disappointed. I'm still not sure if I want to see the movie or not... it's been hit or miss for the last few where I had read (and loved) the book first. Great review, though, Mary :) Thanks for sharing.